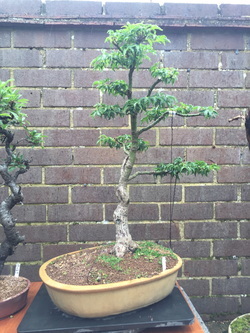 Another interesting cultivar/variety; this slow growing tree has tight pads of deep green crinkled leaves, which turn in on themselves at the edges. Seasonal leaf colours include: light green, deep green, yellow, and orange and reds. An 11cm mame in a peach/brain skin glaze (Karaigi Yu) pot by Lmaoka Machinao. 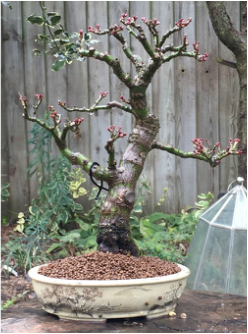 Spring 2016. In a pot by Bryan Albright. 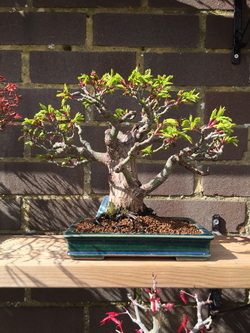 Shohin Shishigashira, spring '16, in a green oribe glazed landscape pot by Ikkou. 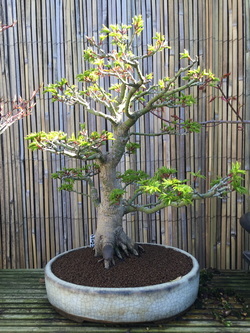 A chuhin tree planted in a crackle glazed pot by Gordon Duffett.